I was honored to be the second-ever interview guest of Arjun Collins, host of Arjun’s Arrow, a good friend, and former colleague. 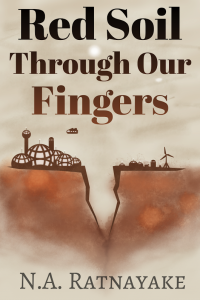 Check out this audio interview of me about Red Soil Through Our Fingers. We had a great conversation about economic exploitation, engineered environments, genetically engineered crops, the need for a strong public space policy, and how the exploration of space can help us develop technology for sustainable living here on Earth. Post a comment and subscribe (either here or on Arjun’s Arrow) and I hope you enjoy the dialogue. Haven’t yet picked up your copy of the novel? Learn more and order your copy now. Dr. Linda Billings has published an article entitled “The Inexcusable Jingoism of American Spaceflight Rhetoric” in Scientific American’s Forum. I read the article with great interest, because I find myself on both sides of her argument. On the one hand, human expansion into space is happening, whether we like it or not, and regardless of any government program’s mission statement. Where previous generations perhaps imagined the push into space driven by big national programs, we are seeing now that it is likely to be corporations or private interests staking claims out there at least as much as governments. In fact, multiple companies have already declared near-term space intentions such as orbital tourism, mining lucrative asteroids, extracting fresh water and hydrocarbons, and settling on the Moon and Mars. But here is where Dr. Billings is absolutely correct: We need to make sure our expansion into space results in an equitable, sustainable, and responsible distribution of the truly staggering amount of resources right here in our own solar system. And that will definitely require a cultural shift in how we talk about spaceflight. Language is a technology, a doorway, a weapon, and an agent of change and hope. As it shifts both form and function, the metaphors that describe it change too. Language is a technology that has shaped our brains. Ted Chiang’s novelette The Truth of Fact, The Truth of Feeling (a Hugo nominee last year) particularly struck me as revolving around the same complex issues — how important language and particularly writing has been to the human psyche. Language changes the way we think — it is a tool that can be both used and misused to great effect. The publishers of We See a Different Frontier and Outlaw Bodies are putting together a new anthology that continues their social justice streak. The new anthology, Accessing the Future will explore “disability and intersecting nodes of race, nationality, gender & sexuality”. This anthology will call for and publish speculative fiction stories that interrogate issues of disability—along with the intersecting nodes of race, nationality, gender, sexuality, and class—in both the imagined physical and virtual spaces of the future. We want people of all abilities to see themselves, as they are now and as they want to be, in our collective human future. Accessing the Future will be a collection of speculative fiction that places emphasis on the social, political, and material realms of being. We aren’t looking for stories of “cure,” that depict people with disabilities (or with other in/visible differences) as “extra special,” or that generally reproduce today’s dominant reductionist viewpoints of dis/ability as fixed and a problem to be solved. We want stories that place emphasis on intersectional narratives (rejection of, undoing, and speaking against ableist, heteronormative, racist, cissexist, and classist constructions) and that are informed by an understanding of dis/ability issues and politics at individual and institutional levels. We want to hear from writers that think critically about how prosthetic technologies, new virtual and physical environments, and genetic modifications will impact human bodies, our communities, and the planet. I just became a backer this morning. If you’re interested in expanding the diversity of perspectives within science fiction, this is a great opportunity to get behind a project on the front lines of imagining a more socially-just humanity. Sci-Fi Story Elements That Really Hook Me!